This Zombie Nomz cake by cake artisan Lauren Babis reminds me a lot of the movie Donnie Darko. In that it makes absolutely no sense to me… but I love it. Sure. 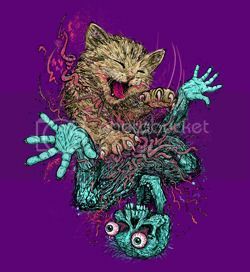 Obviously it’s a cat ripping a terrified zombie to shreds. Which is fantastic. The cats are your greatest allies and the zombies worst enemies. They run rampant throughout the streets and once you know all there is to know about killing zombies, the cats will help you. But only then. You must go through levels of torture to obtain skill and know-how before the god-like hand of the cats’ raging claws and jaws become your savior. The cats are the greatest who of the what, now? Obviously the cat’s natural predisposition to zombie-slaying in the aid of humans who have proven themselves worthy by progressing through escalation of pain and knowledge-gathering (like, how to tie a double fisherman’s knot or something?) is news to most of us. Personally, I wouldn’t have credited cats with waking up in the morning in the service of humans. But yeah, I guess I could see how cats could be biding their (lazy, selfish) time until a zombie apocalypse arrives to reveal their merit. I assume that disemboweling the undead to save humanity is going to require a lot of energy that the cats need to save up, and that would explain why they are so useless in every other way during these relatively peaceful pre-apocalyptic times. Yeah. Actually, that would explain a lot. Whether you buy the Jesus Warrior Cat story or not, you’ve got to respect the execution of the cake, which is based on this t-shirt design from Threadless. The piece features sponge cake, buttercream and marshmallow fondant, and appendages crafted from rice krispie treats and fondant. A few wooden chopsticks support the creation, and the minor details are made of gumpaste. For more details on the god-like hands of battle-cats and tons of “making of” photos, check out the Zombie Nomz cake on Threadcakes. 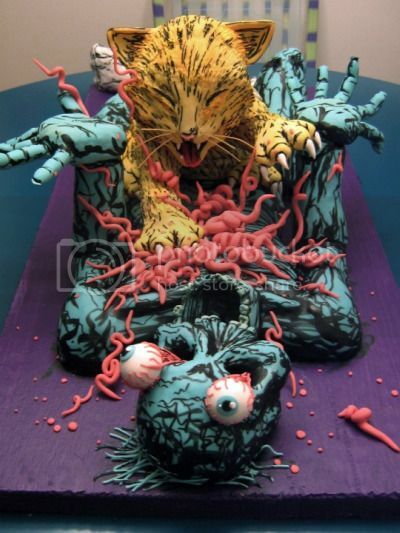 Find more fantastically-ridiculous cakes in the book Cake Wrecks: When Professional Cakes Go Hilariously Wrong. Wait, with this logic it means that cats are immune to turning into zombie cats. I need to make friends with a crazy cat lady fast! This takes GCotW to a new level. Bravo! Concept of cats disliking and shredding zombies = plausible. Cats have their redeeming values, such as rat killing, dog chasing, night stalking which should translate to zombie stalking and shredding. To save humans? Not so much. There are some exceptional cats who give a flip about their humans. That is a fantastic replica. Absolutely disgustingly awesome! Come on, cats could only inflict such damage if they were three times their actual size as portrayed in the shirt/cake. In ‘real’ life, zombies would squash the utterly useless housecats, claws be damned. Alright Snark, you win. I am following you on Twitter.